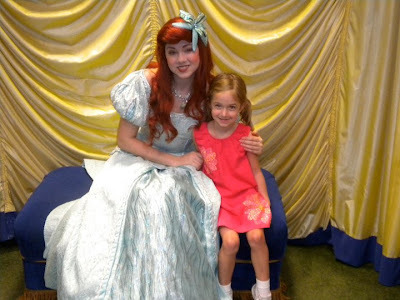 So our first day in Disney was Saturday. 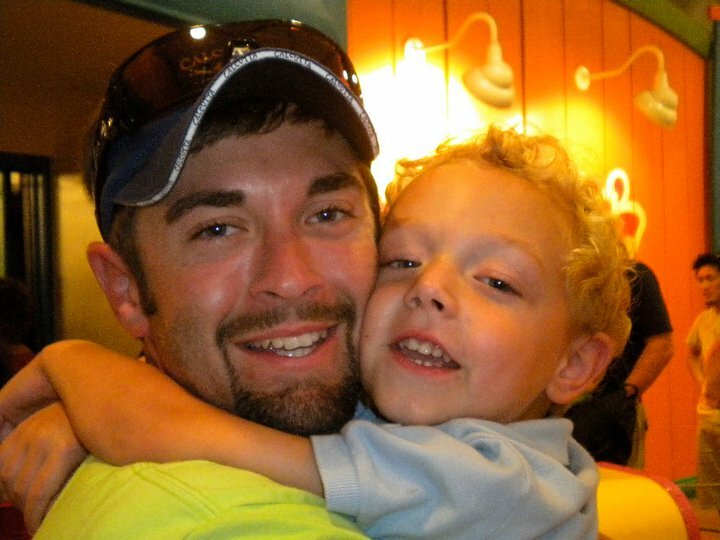 We decided instead of riding in the car with 2 kids during the day we would rather drive all night and just be tired the next day. So we left Mobile around 11:00 and drove straight thru to Disney. We got there around 7:30. It was thankfully an uneventful drive and the kids slept until around 6 and then fell back to sleep right as we were getting there. 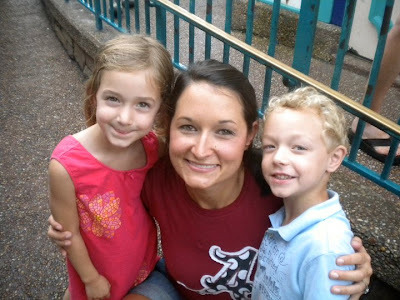 I went and checked us in and got our park tickets while the 3 of them slept in the truck. On our first day we made the mistake of driving to the Magic Kingdom. BIG MISTAKE. The Magic Kingdom has 100 different means of transportation you have to take to get to the park once you park the truck. It was not fun. 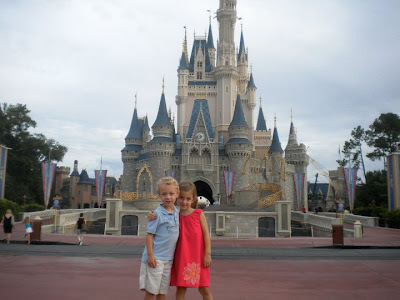 Once we got in the park we took a quick picture in front of the castle before their clothes were messed up! 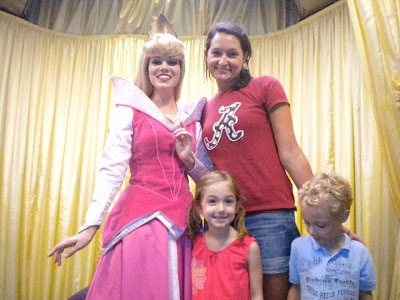 They weren't as excited as I thought they would be to see Cinderella's castle. I think maybe because I don't like cartoon characters so we don't focus on them at our house...who knows. I had read a few guidebooks before we went and I knew to make our first stop in Magic Kingdom Fantasyland. It's the most preschool centric part of the park and gets packed quickly and stays packed all day. 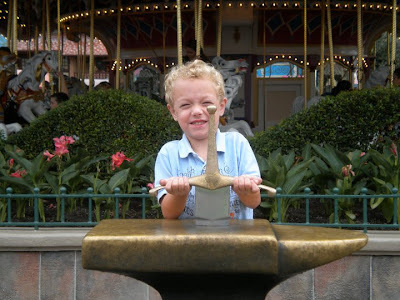 Our first ride was Dumbo, then we headed to Winnie the Pooh, Peter Pan, Snow White, The Carousel and Mickey's Philmagic. 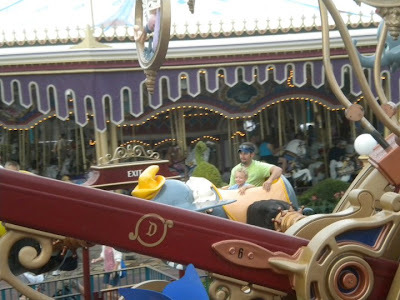 There are 3 types of "rides" at Disney...the amusement park kind, the get in some sort of vehicle and ride through while it tells a story and then theater style rides. We like amusement park rides not really the other 2. Ryan has a 3 second attention span so the other 2 bored him and the kids. I wish in Disney there were more amusement park type rides. 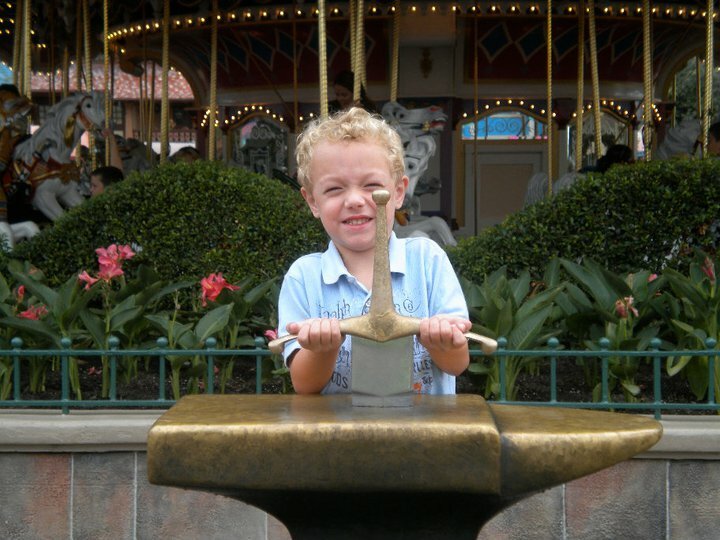 Tanner pulling the sword out of the stone...or trying to at least! Our next stop after Fantasyland was Tomorrowland. 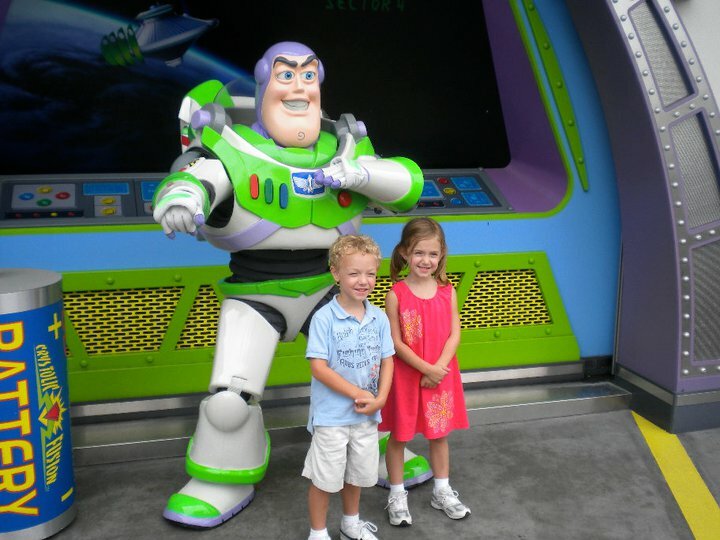 In Tomorrowland we first rode the Buzz Lightyear ride. That ride was a big hit with Tanner he loved it!! We then rode the Tomorrowland Speedway which is like go cart racing. The kids got to drive on that ride and they loved that. We then headed to Toontown which was a lot of fun! 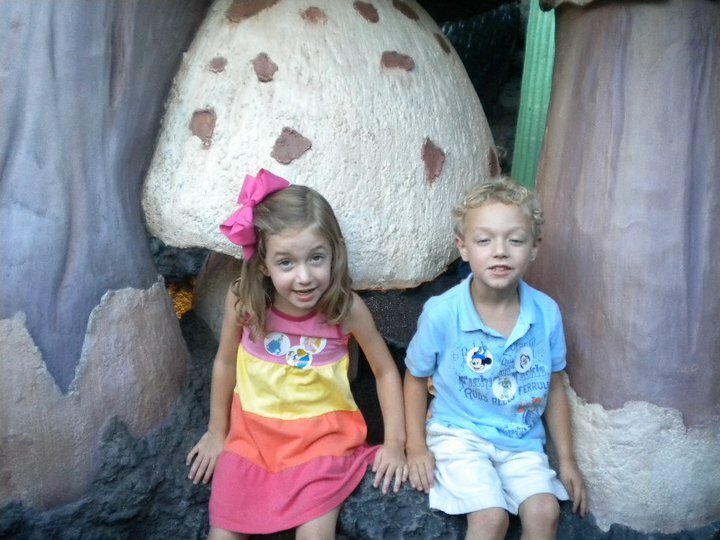 The kids loved getting to play in Mickey and Minnie's houses. They also rode Goofy's roller coaster. Ryleigh liked it, Tanner hated it. 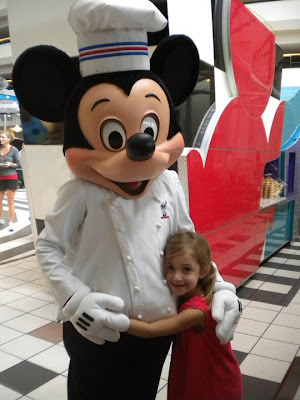 We decided to skip the lined to meet Mickey and friends since we were going to have lunch with them. Instead we stood in line to meet the princesses. By this time it was time for our lunch reservations. We were eating at Chef Mickey's in the Contemporary Resort. We rode the monorail over to the resort for lunch. Normally I wouldn't want to leave the park for lunch but I had worked it out where we would eat lunch then go back and take a nap in our room since we had been up all night. 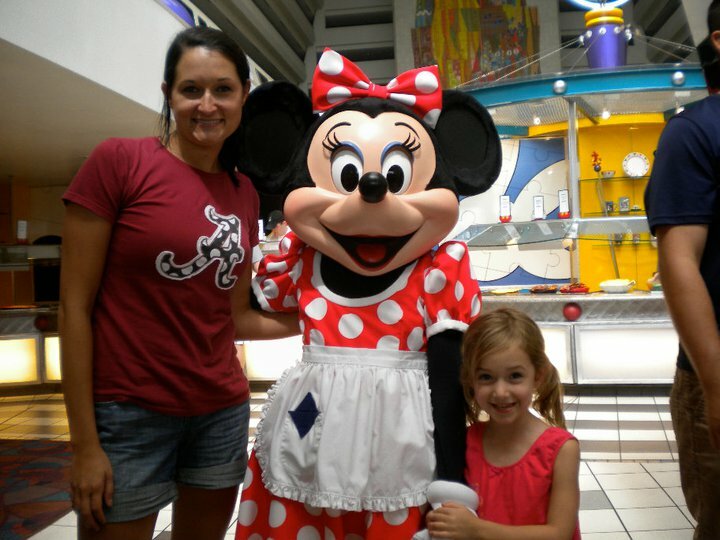 Ryleigh's favorite character...Minnie!!!! 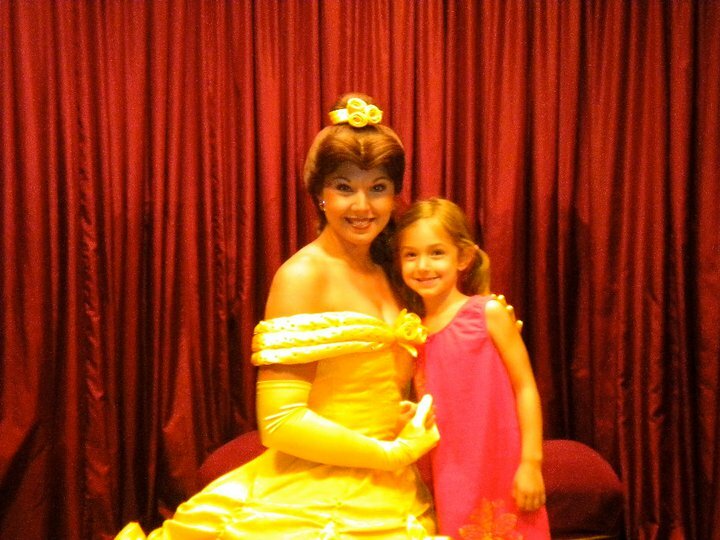 She loves her the most out of any Disney character and was so excited to meet her! The character meals are the way to go. Hands down if there is one thing I had to say saved us the most time and made our dinners/lunches the best it was the character ones. The kids get to meet the characters without us standing in line for an hour and it gives them something to do while Ryan and I eat. The character lunches were our most enjoyable meals. 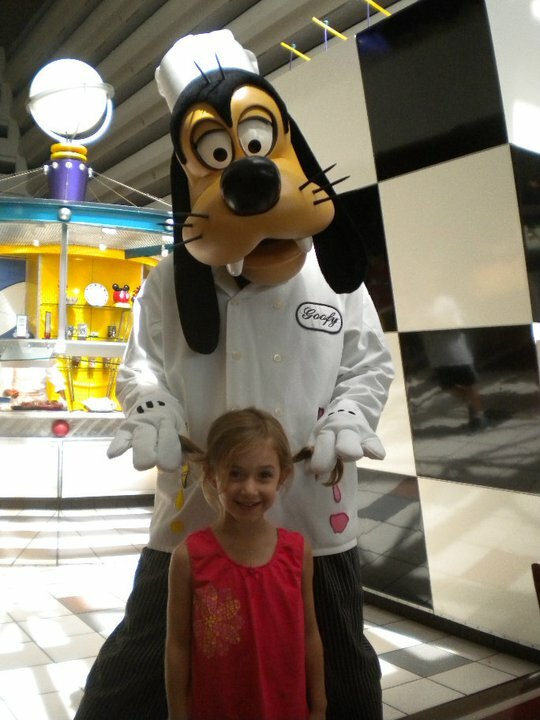 Ryleigh and Goofy being Goofy! After lunch we made the hour trek back to the truck and went back to our resort. We stayed at Pop Century which is considered a value resort but we loved it! Maybe it was the price, maybe it was our room location but we loved this resort! It was perfect for our family. 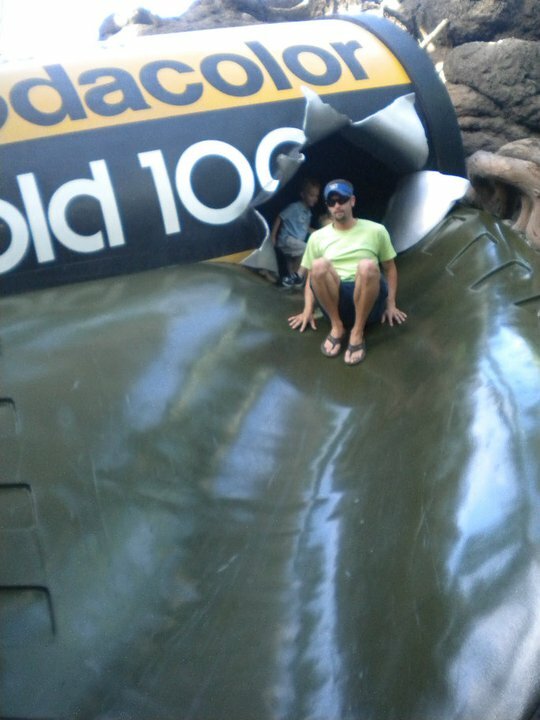 Especially for the amount of time we stayed in it. Which was just to sleep at night! The kids had fell asleep on the way back to the truck so they didn't really want to take a nap. I managed to get them to lay down for about 45 minutes and then the 3 of us went to explore our resort while Ryan slept a little longer. That night our plan was to head to downtown Disney but we made a last minute (like standing in line for the bus last minute) decision to go to Hollywood studios instead. 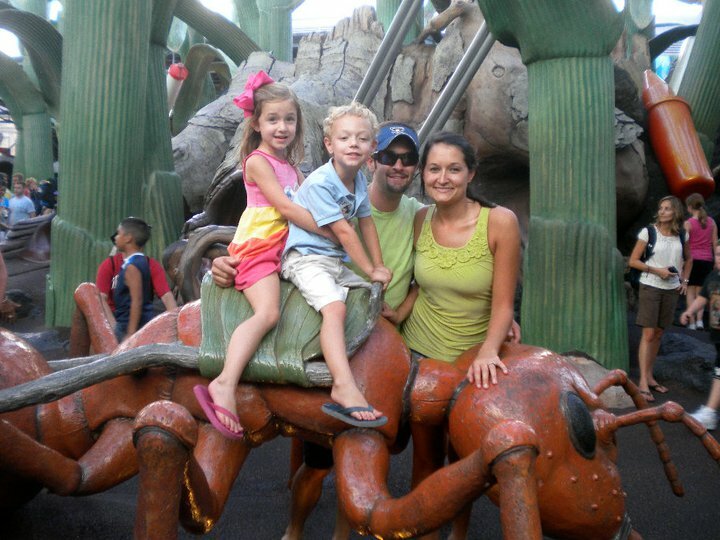 They LOVED the Honey I Shrunk The Kids Playground. LOVED it!! We just walked around there and looked. 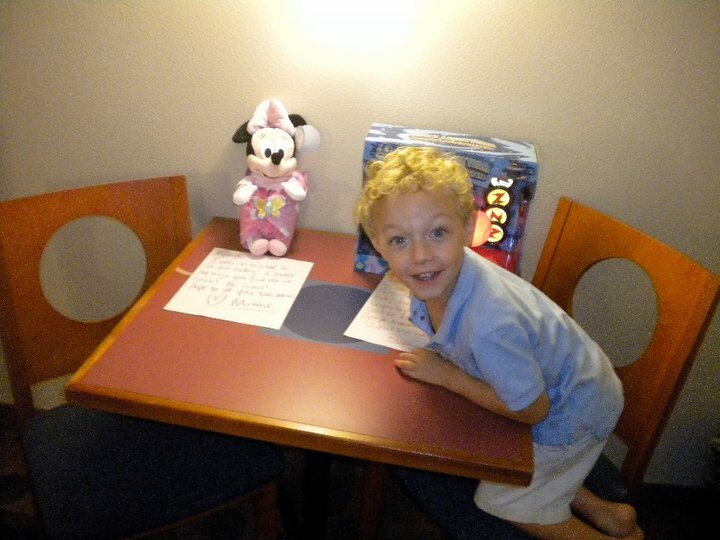 We were planning on going to Hollywood Studios the next day so we were just scoping it out. I feel like we rode something else but I can't remember what. We went back to our resort and had dinner there and the kids and Ryan played in the arcade while I went to play Santa Clause!! Their favorite character are Buzz Lightyear and Minnie and thankfully we got to meet both our first day! So I went and bought them both something from the gift shop that they had been asking for all day long. Seriously every ride we went on or store we visited this is what they wanted. I got Ryleigh a baby Minnie and Tanner the Buzz lightyear gun. 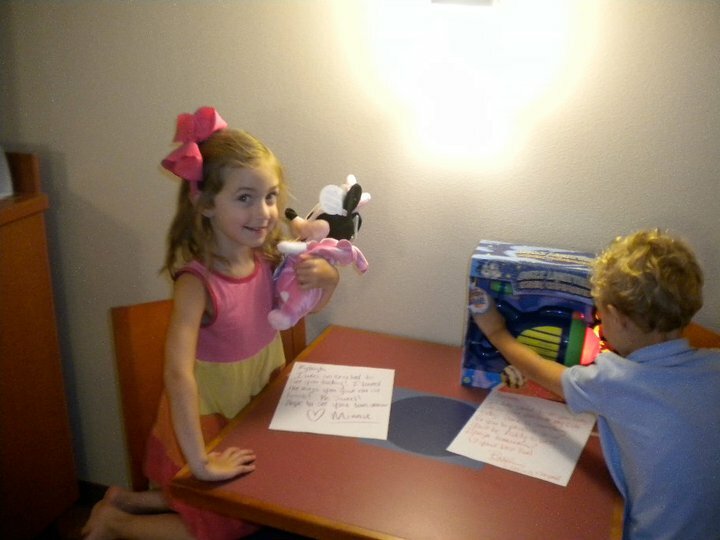 The were so surprised when they got back to the room!! 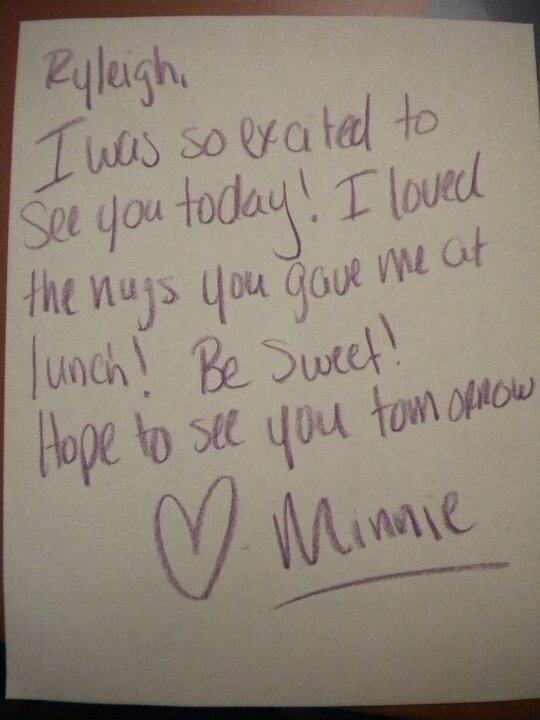 I wrote a letter from Minnie and Buzz to each of them. They seriously thought that they came to their room when we were at dinner. The next day they were just telling random people all about the letters they got from Buzz and Minnie and how they came to our room when we weren't there!! We had a fun first day but we were EXHAUSTED!! !